OK, who’s with me on this? I’m kicking and screaming—it’s still summer! For autumn’s sake, please, no pumpkin. Not yet. 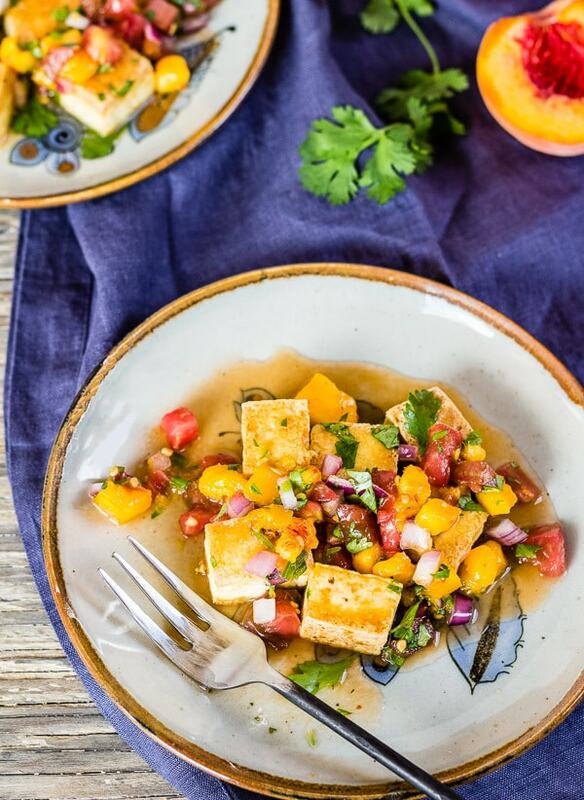 Right now, with produce bins brimming with the best of the season, let’s take advantage and turn those juicy sweet tomatoes and peaches into peach and tomato salsa with pan seared tofu. 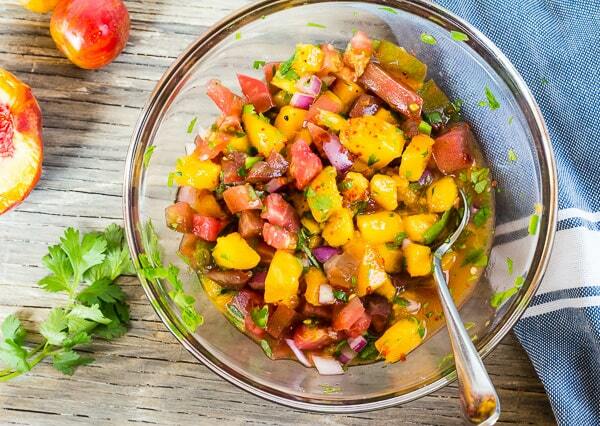 Lime and honey with fresh peaches and tomatoes, spiced with jalapeño chile, red onion, and cilantro—it’s the best! Sauté flavor-neutral tofu until it’s golden crunchy on the outside, tender chewy on the inside, and then off the flame, while the pan is still hot, pour the peach and tomato salsa all over. 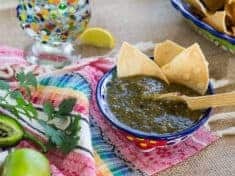 The tofu absorbs the flavorful salsa juices for a most delectable vegetarian feast. I know, some folks kick and scream if they even hear the word tofu. 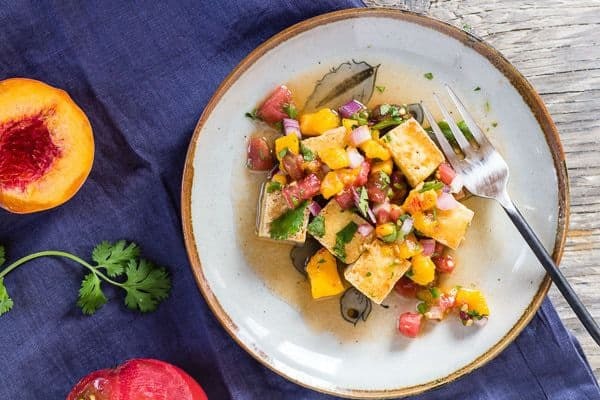 If that’s the case, never mind the tofu—this peach and tomato salsa is perfect for tortilla chip and melty quesadilla dipping! In this recipe, you’ll learn how to press tofu for best texture and, dare I say, it will be like vegetarian “chicken.” When done right, pressed and pan-fried crispy, protein-rich soybean tofu is downright pleasing. Pair with spicy juicy peach and tomato salsa for tofu heaven! To DIY press tofu, use tea towels, the ones without terrycloth nubs. Alternatively, soak up the excess tofu water using ample paper towels. You can also use a tofu press, like this or this. Handy if you cook tofu frequently. Aleppo pepper, with its fruity moderate picante, grows in regions around Aleppo, Syria. If you don’t have Aleppo pepper, substitute a smaller pinch of red pepper flakes and a few grinds of black pepper. Soy free: Use chickpea tofu. Vegan: Use agave syrup or maple syrup instead of honey. Our neighbor gifted us halibut he’d caught in Alaska and says pan-seared fish is incredible with this peach and tomato salsa. I bet it’s delicious over chicken too. You might also like grilled spicy orange-glazed tofu with fennel and red onions. 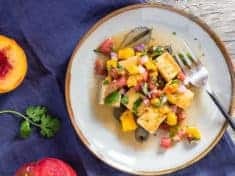 Fresh peach and veggie salsa with pan seared tofu is part of September’s seasonal recipe roundup organized by our friend Becky, from The Vintage Mixer blog. 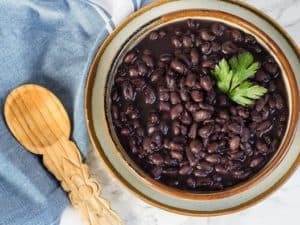 Link to Becky’s first post this month, for a unique and diverse recipe collection featuring summer’s vegetable and fruit bounty. 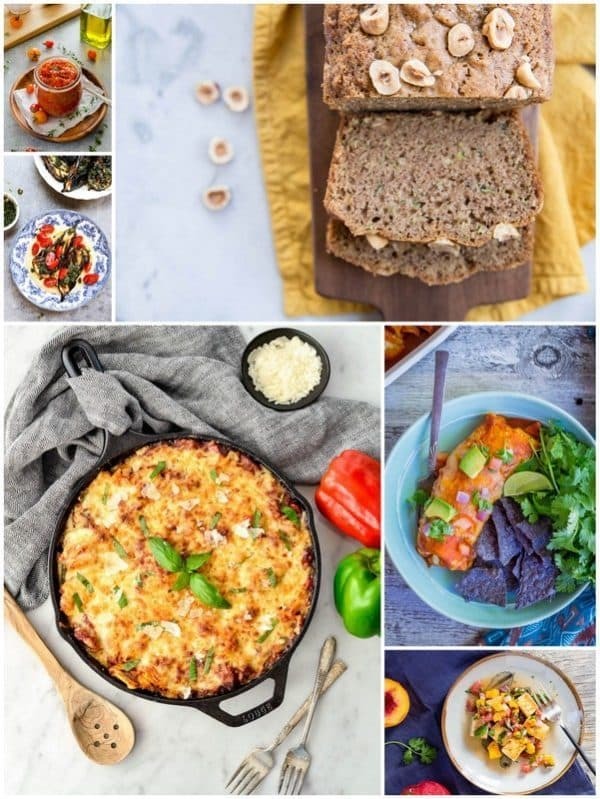 By way of the links below, we hope you’l find more recipes to encourage you to get in the kitchen and cook something delicious—and seasonal. 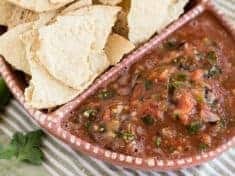 Fresh peaches and tomatoes, juicy with lime, honey, jalapeño chile, red onion, and cilantro--this salsa brightens everything you pair with it! Perfect with tortilla chips, quesadillas, and tacos, and as here, with golden, crunchy on the outside, tender chewy on the inside, tofu! Cut the tofu into 4 rectangles, about 1-inch thick. While the tofu is pressing, mix all the salsa ingredients in a bowl. After 15 to 20 minutes, pressed tofu will be thinner, much firmer, and easier to handle. 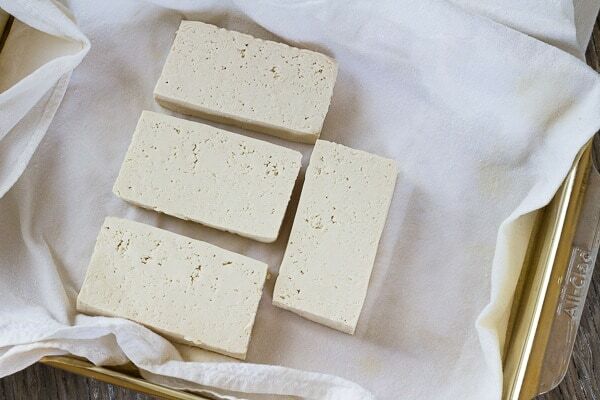 Cut the pressed tofu into 1-inch cubes—to yield 24 cubes. Season with salt and pepper. Heat the coconut oil in a large skillet over medium high flame. Arrange the tofu cubes in a single layer in the pan, and cook until one side of the cubes have golden crisp edges, about 10 minutes. Turn the cubes over and cook until the tofu has caramelized crunch on the second side. Turn off the heat and pour the salsa over the tofu, just to heat through. 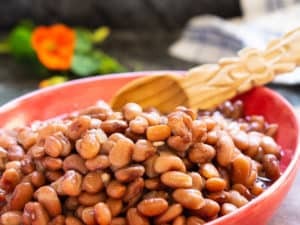 Serve immediately, in a bowl or on individual plates. I weight my tofu with a blender. Instead or pressing out the water DYI with towels and weight, you can use a tofu press, like this or this. Handy if you cook tofu frequently. The tofu can be pressed for more than 30 minutes. After 30 minutes or so, you'll want to refrigerate the tofu, pressing assembly and all. If you don’t have Aleppo pepper, substitute a smaller pinch of red pepper flakes and a few grinds of black pepper.